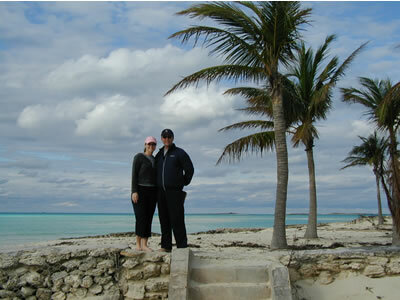 We have been in the Bahamas for six weeks now. With all the major outfitting and preparation behind us, it’s finally Play Time! Our last trip report ended with a picture of our first sunset in the Bahamas after crossing the Gulf Stream from Ft. Lauderdale. 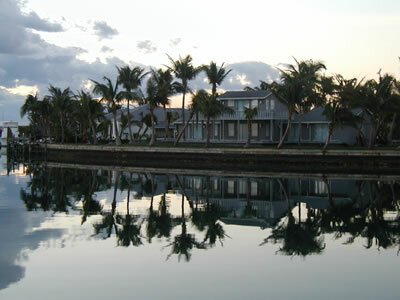 As I begin writing this installment of our trip log, we are swinging gently on a mooring we have rented for the month of April in Hope Town Harbor at Elbow Cay in the Abaco Islands of the Bahamas. Melissa’s cousin, Mendy, and her husband Jim Shanley are scheduled to visit us toward the end of the month. So, we will hang around the Abacos for the month of April and enjoy this area to the fullest before moving south to the Berrys and Exumas. Here is a map so that you can orient yourself with the Abacos. Refer to the map as I make references to various Cays (pronounced keys) during this report. There will not be a written exam, so feel free to not pay attention! Some of our friends don’t read anything here at all – they just look at the pictures. That’s ok too. Enjoy! So, untie from the dock; here we go! As we awoke on our first day in the Bahamas, we felt far away from our home of Louisiana. And we were. We had traveled over a thousand miles since we left New Orleans -- and remember -- that’s at an average speed of only about six knots. While sitting in the aft cockpit of Indigo Moon on our first afternoon in the Bahamas, I contemplated the emotional and physical hurdles of our transition to life aboard and the journey thus far. Deep in thought, I watched various boats come and go, occasionally gazing over the side of the boat in amazement at the clear water and starfish. I noticed a PDQ Catamaran entering the Old Bahama Bay Marina, making her way beside us and approaching to dock immediately aft of us such that we would be stern to stern. I read the name: Dream Chaser (not catcher mind you, but chaser). Nice name, I think. Then I read the hailing port: Cypremort Point, Louisiana. You gotta be kidding! 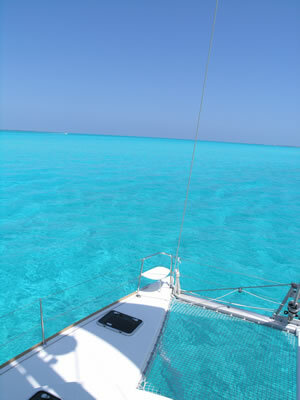 Two catamarans full of Cajuns are concurrently invading the Bahamas! It gets thicker. The owners of Dream Chaser are Louisiana lawyer Ray Allain and his sweet wife, Rebecca. 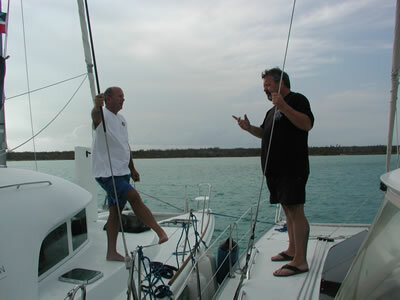 Along with them is good friend, Robert Guillotte, an experienced sailor who has owned large catamarans in the past. So, as it turned out, two Louisiana lawyers were invading the Bahamas. 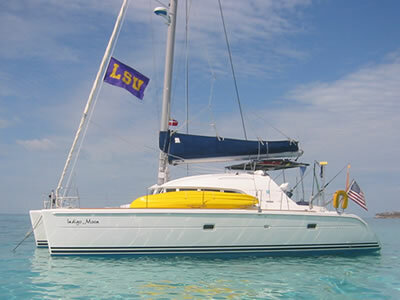 Now ask yourself: What would any self-respecting Louisiana Cajuns from deep in South Acadiana do to outfit a catamaran? Well, what they did on Dream Chaser was remove an entire aft cabin berth in the port hull and install a HUGE full-size freezer in place of the bunk. Then, they filled it with crawfish tails, boudin, sausage, seasoned turkey roasts, Cajun-seasoned hamburger patties and other such life sustaining necessities. Needless to say, we became instant friends as all Cajuns do. 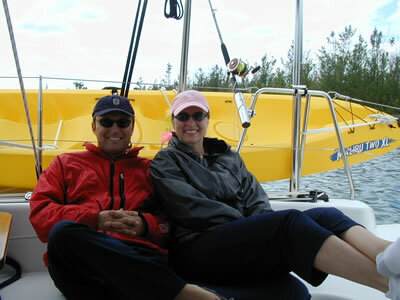 We very much enjoyed cruising together for a week as we both had destinations of Marsh Harbor the next week. Further, as it turns out, their plans had changed such that their boat was over-provisioned and they had to figure out a way to eat up all that great Cajun food in the freezer. Always willing to go way out of our way to help fellow cruisers, no matter how onerous the task, Melissa and I ate and ate and ate and ate, and it was good, cher! 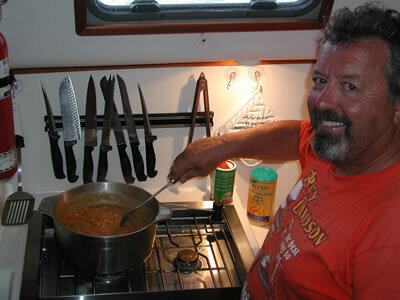 Robert Guillotte, fantastic chef that he is, enjoyed demonstrating his culinary skills. 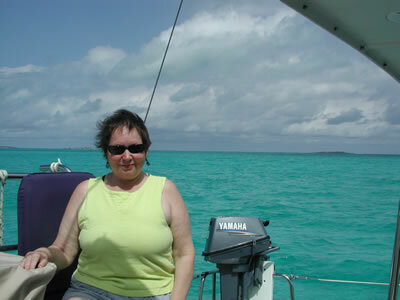 Our trip from West End included a stop at Great Sale Cay for an overnight anchoring where we rafted up for the night. The next few days saw us sailing east and then south along the Sea of Abaco, to Spanish Cay, Green Turtle Cay, Treasure Cay and then to Marsh Harbor and Hope Town. Buddy at the helm wearing his “Team Flamingo” hat given to him by our great friend Captain Bobby Overall of Baton Rouge. 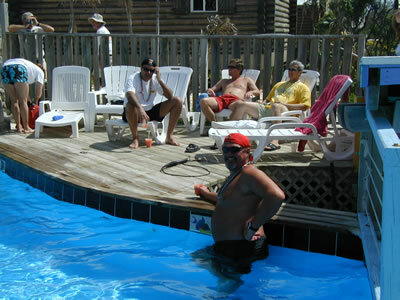 Team Flamingo is comprised of a handful of folks with camps down in Cocodrie, Louisiana. Bobby also gave us some great music CD’s for us to listen to and we are really enjoying them. It seemed only a split second later that Robert, a consummate deal-maker, had negotiated a trade of some of his “Cajun Freezer Bounty” for Captain Fourty’s “Bahamian Bounty” of lobster tails. A bag of sausage, boudin, crawfish and Cajun burgers fetched a few pounds of Lobster tails. It was great fun. We spent a couple of nights at Treasure Cay and also enjoyed meeting Captain Fourty’s delightful wife, Florence, and their son, Chuck. Florence is a skilled baker of pies and bread. 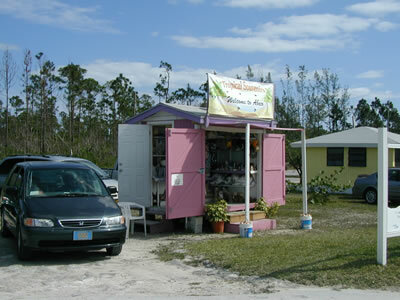 She began her business selling her baked goods on a folding table outside the local grocery on weekends. Within a few weekends, word spread and in short order demand quickly warranted opening a bakery of her own. 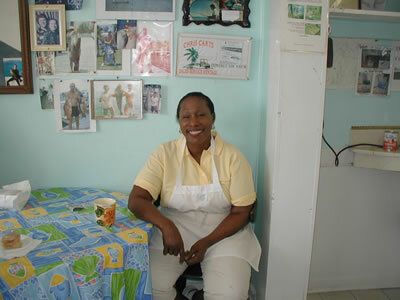 Every morning all the local “power brokers” of Treasure Cay (they have a special table), make their way early to Café La-Florence for coffee and a typical Bahamian breakfast of chicken souse and grits, or hot cinnamon rolls, pies, and breads – you name it. By the way, those Cajun burgers from Robert ruined Chuck. Every time I see him he gives me this big grin and says: “Hey mon, you got to get me some more of da burgers, mon!” So Robert, if you are reading this, e-mail me so that we can figure out how to at least season something here to help Chuck with his Cajun-burger-delirium-tremens. To get to Treasure Cay from Green Turtle Cay, we continued heading south along the island chain by briefly venturing out into the Atlantic Ocean, around Whale Cay. As you can see by the map above, the Sea of Abaco is a large inland body of water located between the large island of Great Abaco to the West and the barrier reef islands (Cays) to the east. 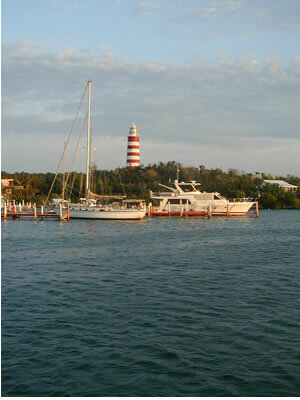 As such, the Sea of Abaco runs approximately northwest to southeast for miles and miles and offers excellent protection from the Atlantic Ocean as one sails to and explores the various Cays that make up the barrier islands of the Abacos. 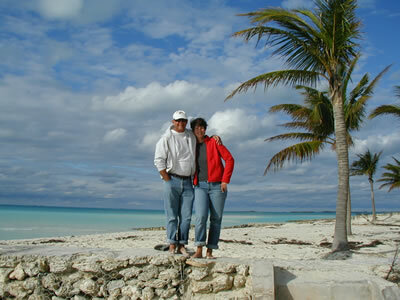 Also, the Sea of Abaco is relatively shallow. It is often ten to fifteen feet deep, and occasionally twenty five feet where currents flow between Cays. 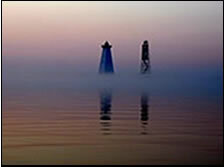 As such, the sea state in various wind conditions is exactly like Lake Pontchartrain at New Orleans. In heavy wind, the seas stack up with closely-spaced waves making it rough going sometimes. 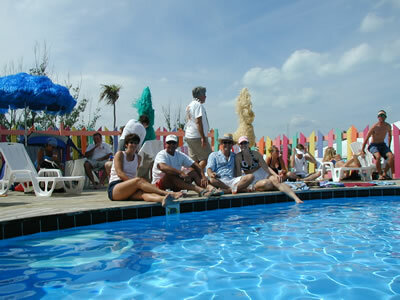 So, considering all that, we are right at home and know what to expect out in the Sea of Abaco. 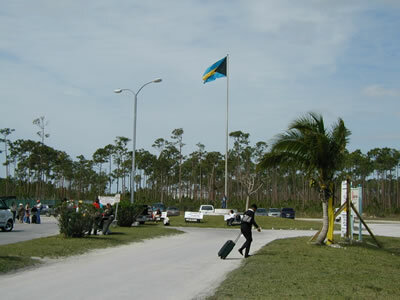 “The Out Islands” are technically defined as every island outside of the most populated islands in The Bahamas— Grand Bahama ( Freeport) and New Providence ( Nassau), but in slang it is used to refer to the barrier island Cays. The term "Out Island" reminds me of something that made me laugh out loud one day. Bahamians are very religious and very political. And they are very pleasant and friendly too. You can hear all sorts of entertaining preaching on the local radio station FM 93.5, and also hear lots of political talk and call-in shows during the week. Every business establishment you step into at Marsh Harbor has the same radio station playing. One Sunday I was listening to a Reverend wrap-up his morning show. He was getting more and more animated in what seemed to be ten second plateaus. Finally, in his very passionate summation, in full Bahamian accent, all while still building to a spectacular crescendo he declared: “An finally, God bless everyone! Bless all da men; Bless all da wimmin; Bless all da children of da Bahamas! Bless all of da Bahamas! -- (pause) -- even da Out Islands!!!! As such, the “Out Islands” were obviously lucky the Reverend was in a particularly generous mood that Sunday! 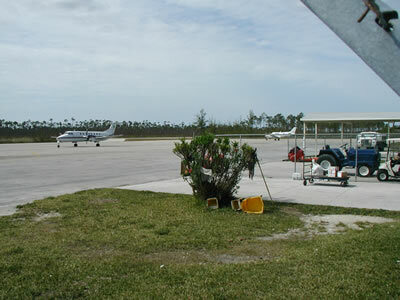 The Sea of Abaco is sectioned into a northern portion and a southern portion due to a large sandbar running completely across the Sea of Abaco from east to west for a few miles. The sandbar starts in the east at the inside shore of barrier island Whale Cay and runs all the way west to the Great Abaco Island near Treasure Cay. Shallow. Four or five feet maybe -- at high tide. There is a passage named “Don’t Rock” that runs across this sandbar, but it’s risky because ocean swells sometimes find their way around to the backside of Whale Cay and cause a vertical surging that can pick you up and pound you down on the sandbar -- repeatedly. Not good. Keels, props, struts and such need to stay poking outward, outside the hull and not get punched through to the inside! We heard of a couple who sold everything and moved on a boat just like us. They tried Don’t Rock in the wrong conditions and got repeatedly pounded up and down on the bottom such that the boat was completely destroyed -- the boat was slowly turned into big pieces and then little pieces by the up and down surge action against the bottom. They allegedly got a few of their clothes off the boat and that was it. We were not willing to risk Don’t Rock Passage. 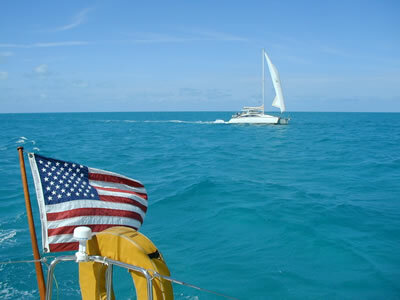 Therefore, in order to get around the sand bar as we headed south, we had to go out of Whale Cay Passage into the Atlantic Ocean, head out a mile or so and then head south a couple of miles in the Atlantic to pass Whale Cay. 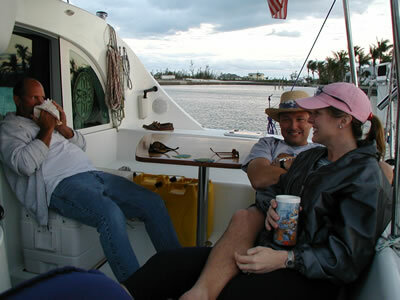 Once past Whale Cay, we then ducked back into the Sea of Abaco via the Loggerhead Channel south of Whale Cay. This passage, folks, can be a killer, literally. Here’s why: about four miles off Whale Cay the Atlantic gets deep real fast – over THREE THOUSAND FEET deep less than three miles off Whale Cay! 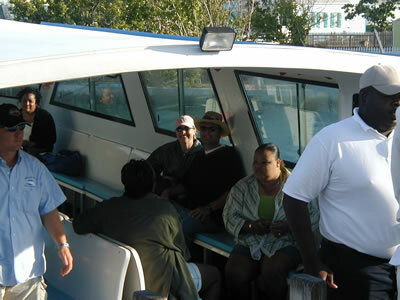 The Whale Cay passage is, at its shallowest, only FIFTEEN FEET deep for about one hundred yards in the passage! For those of you who don’t have a lot of navigation experience, a drop off from fifteen feet to over three thousand feet in that short a distance is phenomenal. Any good surfer can tell you what happens when large ocean swells roll in, unimpeded, to an abruptly and extremely shallow bottom: huge, breaking waves. So here is the rub. 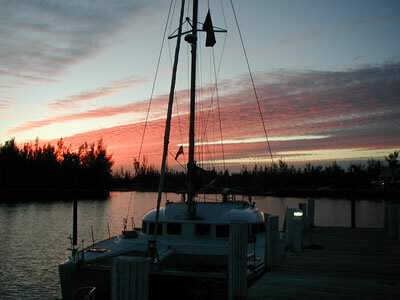 It can be flat calm and sunny in the Sea of Abaco, but if there is a disturbance in the Atlantic, sometimes hundreds of miles away, that sets big incoming swells into motion, then the Whale Cay Channel can produce huge breaking waves that span the entire width of the Channel as they roll in – a condition referred to as the Channel being “closed out.” The locals call such conditions a Rage Sea and if the Whale is raging, then you must delay passage until it calms. 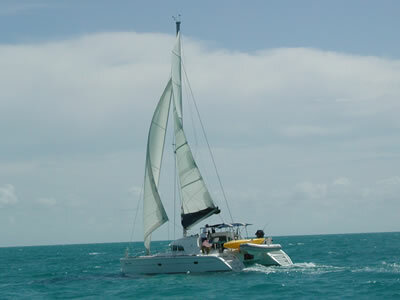 Conversely, the wind can be blowing offshore at thirty knots out of the west and the Sea of Abaco can look like a giant Maytag on heavy duty wash, but the Whale can be very passable with no breaking waves at all and with the outside Atlantic flat-calm near shore, in the lee of the west wind. 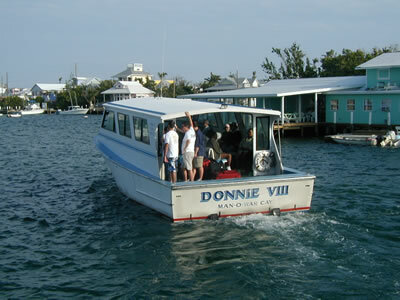 Accordingly, the scenario at Whale Cay on any given day can be very counter-intuitive for even the experienced seaman. Calm elsewhere can mean rough and rough elsewhere can mean calm. Also, the old “let’s poke our nose out and see what it looks like” can be very dangerous because of the distances that must be traveled to really get a look at the Whale, especially when attempted heading from south to north. To go look, you must be out in the Atlantic already and almost fully commit to entering the Whale Passage. On Indigo Moon we had already read a lot about the Whale and were nervous about this passage. We were very careful and made it without incident on a very calm day. In fact, it was beautiful. The deep waters of the Atlantic provided me with that cobalt blue “fix” that energizes my soul so well. It was a very spooky passage nonetheless. It is literally a graveyard for scores of ships and crew and, though we didn’t notice it at the time, Melissa and I were unusually quiet and said very little during the passage. We discussed it later and shared the same feeling that there is a lot of electricity in the air there. Having made the Whale passage earlier that day on Indigo Moon and Dream Chaser to get to Treasure Cay, with the crew of Dream Chaser present, I discussed the Whale Cay passage with Captain Fourty. I announced my fears of, and respect for, the Whale and how it made what little hair I have stand on end. In response, Captain Fourty’s huge smile vanished instantly. He got very still and in a low, uncomfortable voice he recounted for us the death of a woman only three years ago. 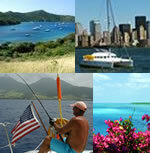 A husband, wife and daughter were on a week-long charter of a monohull sailboat. The husband, a very experienced sailor in other waters, was warned that the Whale might be raging and not to go through it. It was a beautiful, sunny day with light winds and he blew off the warning, much to the disapproval of his wife and daughter. 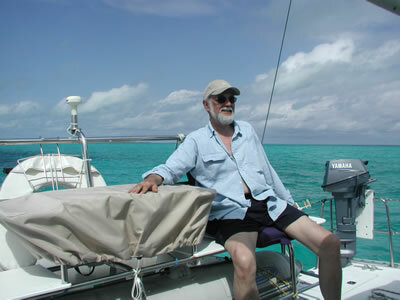 Heading from south to north, he and his irresolute crew exited the Loggerhead Channel and went on the outside into the Atlantic and up past Whale Cay, then turning inbound to try and navigate the Whale Cay Channel to get back into the Sea of Abaco. Near the Whale Channel, and still out in the Atlantic, the boat was instantly swept forward in the jaws of a huge breaking wave. It is reported that that it accelerated to over 25 knots in only a couple of seconds as it surfed down the face of the wave. With no way to steer in such conditions, control was immediately lost and the yacht turned beam-to in the wave and quickly rolled 360 degrees in the leading-edge white-water of the wave as it continued to break all the way up to and through the Channel. The wife went overboard in the disaster. Captain Fourty was called upon to help search for the missing lady. He used his expert local knowledge of wind and currents and found the lady floating face down, dead, a few miles to the north of Whale Cay near “Two Rocks.” Massive damage was done to the side of her head from the boom before going over. Despite their attempts on another search boat along side to prevent the daughter from seeing her mother, she did and immediately began screaming at the father, blaming her mother’s death on his overconfidence and hard-headed refusal to take the clear advice about avoiding the Raging Whale. According to Captain Fourty, it is believed that she never spoke to her father again. There have been numerous tragedies like this at Whale. Not folklore or ancient history mind you, but happening now. By the time Captain Forty finished his remarks we were all speechless for a moment. I had a lump in my throat and tears in my eyes -- it was a very painful story for Captain Fourty to tell. I have great respect for Captain Fourty. He is a very courageous man. Accordingly, it’s not all fun and games all the time out here, folks. What we do as cruisers has real risks now and then. Melissa and I always read everything we can get our hands on and always ask for local knowledge before entering new waters. Our main safety advantage is time. We have lots of it and are not trying to squeeze a trip into one week, nor do we have any pressing plans to cover any particular area of this Mother Earth. If the weather is not right, or if we have doubts, we wait. As I have said time and time again, schedules are the main culprits that most often place yachtsmen in perilous conditions. We have now gone back and forth several times through the Whale. I always say a prayer for those lost there and I can’t help thinking of the terrible accident that Captain Fourty described. We have never seen a Rage Sea as of yet and care not to if we can help it. 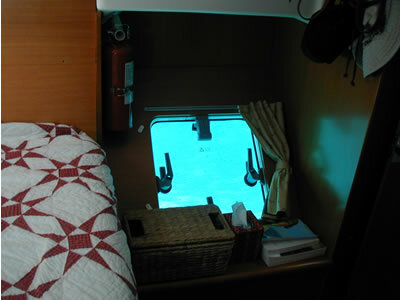 One of our passages was rough, though, with non-rage conditions – an offshore 30 knot wind that caused no breaking waves at all but rather a very rough and unusually confused sea state at the south end near Loggerhead passage. We poked Indigo Moon’s bows into an occasional ten foot wave (again, none breaking) while slowly working our way through under power. Although Indigo Moon was happily negotiating these seas (with careful handling of the rudders and throttles), I don’t think we will do that again intentionally. After a few days in Treasure Cay, my fellow Cajuns aboard Dream Chaser departed and headed for Hope Town, instead of Marsh Harbor, to store Dream Chaser at the Hope Town Marina (better rates). Ray and Rebecca hope to return in May. As stated earlier, we were headed to Marsh Harbor. Friends of ours, Chris and Trula Remson, were flying in to spend a long weekend with us. 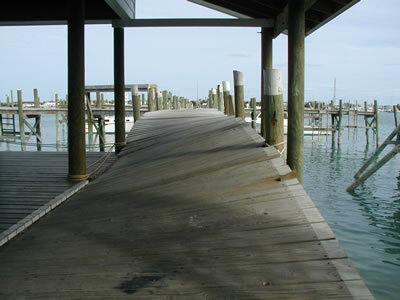 Much of Marsh Harbor is still in a state of disrepair after TWO hurricanes ripped through this area last hurricane season. 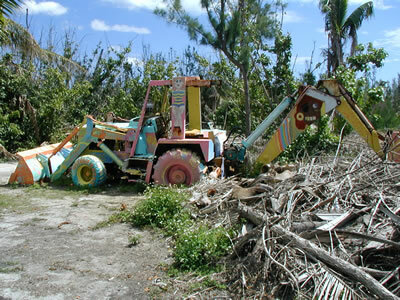 Early in September, 2004, Hurricane Frances ran up the entire chain of Bahamian islands with the Abaco islands the hardest hit. 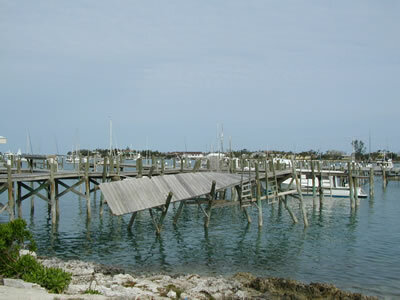 Three weeks after Hurricane Frances, Hurricane Jeanne, a category 3, at first barely missed the Abacos, only to make a 270 degree loop, heading straight for the Abacos with the eye of the storm eventually passing directly over Marsh Harbour. The storm hit during high tide, sending a massive storm surge deep into Marsh Harbour. 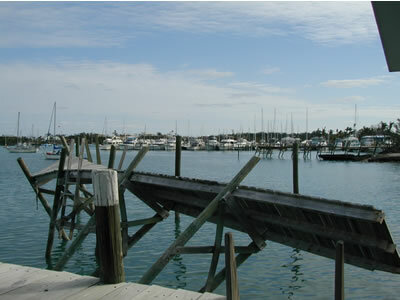 Marsh Harbor is the third largest city in the Bahamas, after Nassau and Freeport, but it is not a “big city” in any sense of the term. There is only one stoplight. Marsh Harbour also has an airport, but it isn’t what you would call an airport really – it’s more of a building with an airstrip next to it, if you will. The weather had been somewhat cool as it was still March, but Melissa and I enjoyed the warm sun in shorts and t-shirts while sitting on a bench, eagerly awaiting Chris and Trula Remson's arrival. 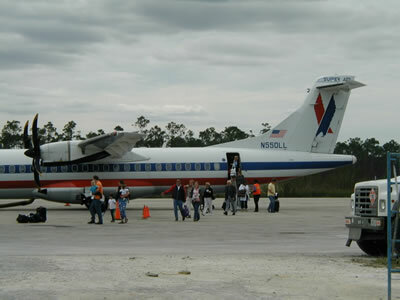 Before long, the American Eagle flight landed and Chris and Trula were in the Bahamas. 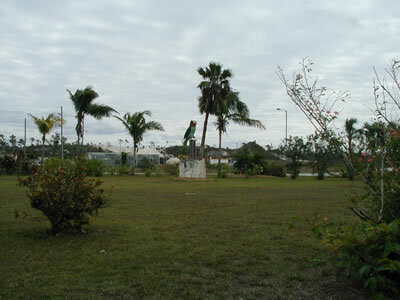 On the way back from the airport with Chris and Trula to the Conch Inn Marina, where Indigo Moon awaited us, we saw the huge parrot statue in the roundabout near the airport and felt it warranted a picture. Nothing says welcome to the Abacos like a big parrot, I guess? On the way back to the Boat, we stopped to pick up some local spirits for Chris and Trula. They bought Nassau Royale rums. As many of you know, Melissa and I both gave up the booze years ago, so we left it to Chris and Trula to enjoy these spirits and report on the quality. 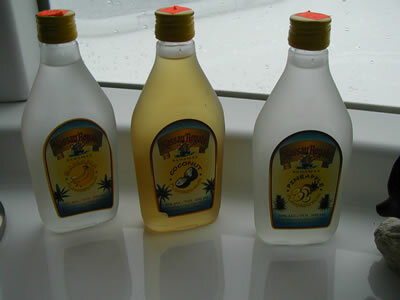 Nassau Royale flavored rums; I think Chris and Trula only liked one flavor, but I can’t remember which – banana maybe? 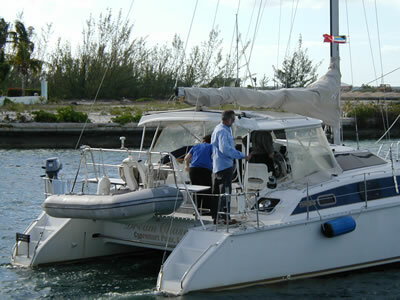 With the boat provisioned and our guests aboard, we departed Marsh Harbor and headed for Treasure Cay. Once safely at anchor there, we took the dinghy in and enjoyed a long walk on the beach. It is one of the most beautiful beaches we have ever seen. The sand is like sugar, no - like flour almost, and rivals the sand quality of the beaches in the Florida Panhandle. The weather was a little chilly, a cold front just having blown though. It was on one of those days where it was cold when the sun got behind a cloud, but it was shirt-sleeve warm when the sun came out. After our walk on the beach, we returned to Indigo Moon for the sunset and we had great laughs while I competed with other yachtsmen for the best (or perhaps worst) sounds to be made with a conch shell horn blown at sunset. It is a peaceful evening in the anchorage, and it will be sunny and warm tomorrow. After a pleasurable stay at Treasure Cay, we decided to sail to Guana Cay because Chris and Trula wanted to go to the Barefoot Man concert at Nippers Bar and Grill. 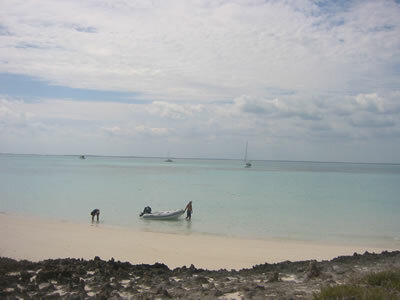 The Sea of Abaco between Treasure Cay and Guana Cay is shallow, has a nice sand bottom and very clear water. Vivid! 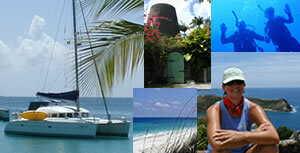 On the way to Guana, we stopped at Fowl Cay, (a nature preserve) to take Chris and Trula snorkeling. Next stop: Guana Cay. 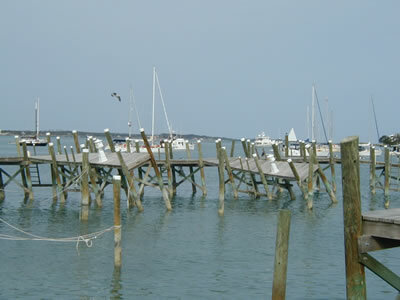 We were lucky enough to reserve a slip in the Orchid Bay Marina, which was packed for the Barefoot Man event. After docking and hooking up Indigo Moon to the marina shore power, we went to the beach. 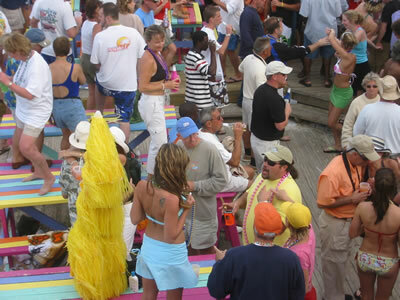 Now mind you, Melissa and I knew nothing of Barefoot Man, much less his annual concert at Guana Cay. Barefoot Man is actually George Nowak. George grew up on Green Turtle Cay (just north of the infamous Whale Cay), and allegedly walked around there barefooted as a kid, always playing his guitar. As a child he had the nickname Barefoot Kid. Naturally, as he became an adult, the nickname morphed into Barefoot Man. 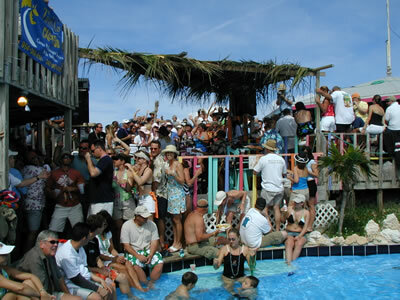 Nippers is a famous Bar and Grill located right on the Atlantic beach atop a forty foot bluff. Below, there is a beautiful white sand beach with great reefs for snorkeling just fifty yards out. Like many places in the Abacos, you can bring your snorkel gear, have lunch and then explore these shallow reefs right off the beach. We settled for a walk and wanted to scope out the territory prior to the Barefoot Man concert scheduled for the next day. 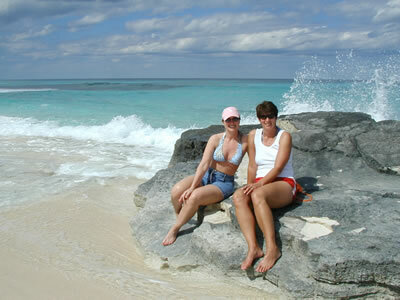 Melissa and Trula pose on the beach near Nippers; Ah-ooooga! 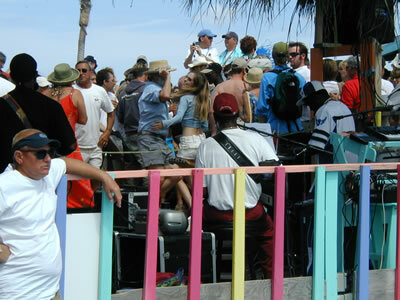 The next day we arrived at Nippers around 11:00 a.m. for the Barefoot Man concert. We met many new friends and also ran into old ones. I swear it seems good Cajuns from Louisiana turn up everywhere. I said hello to some nice ladies from Thibodeaux, Louisiana, namely Lydia Goulas, Becky LeBlanc, Frances Jones, and Wendy Murrian. They know the family of my LSU Law School classmate and offshore fishing buddy, Walt Lanier III, who is now a District Court Judge in Thibodeaux. We also ran into a group of infamous Baton Rouge reprobates, including Gino of Gino’s Restaurant and media moguls David and Kelly Manship. The Manship family owns and operates Baton Rouge’s leading television station, WBRZ Channel 2, along with the Advocate newspaper too. David and Kelly are really fun folks who are full of life and love to cut up and have a good time. They were all in for the Barefoot Man concert too. Turns out that Chris and Trula, architects extraordinaire, designed David and Kelly Manship’s new, custom home now being built in Baton Rouge. The Manship home is almost completed – it is a very unique and a spectacular design that has turned out beautifully, I am told. So, they were all surprised and happy to see each other. 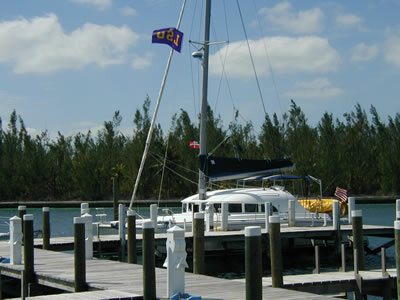 Also, at the marina and docked right across from me, I met Tulane and retired NFL Saints football player, Ed Mickelson, who saw my LSU flag flying high upon Indigo Moon’s spinnaker halyard. He walked up to Indigo Moon, and in real dead-pan and serious fashion, told me; “this boat has to be moved – it can’t stay in this slip” (he didn’t want that LSU flag next to him, considering he is a Tulane Man). It was all in good fun and we had lots of laughs. Ed is a great guy and quite a character. In retirement from the NFL he now enjoys being one of the main owners of the Speedy Oil Change franchise. 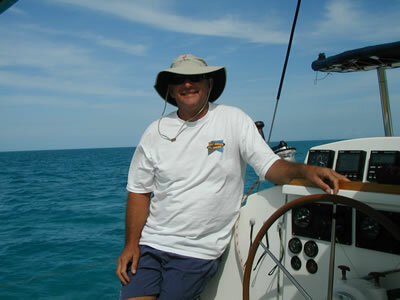 He spends quite a bit of time in the Bahamas aboard his huge Privilege Catamaran named Shearwater. 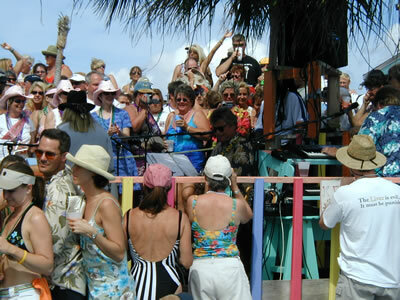 The Barefoot Man concert also included the "World Famous" Nippers Pig Roast. Being a good Cajun, I was skeptical about the Pig Roast. Usually, when you see “Cajun” or "World Famous” outside of Louisiana, it’s going to be third-rate by Louisiana cuisine standards. Outside of Louisiana, “Cajun” usually means too hot to eat, and “World Famous” means they made a fifty-five gallon drum of it and froze it. So, I approached the pig roast with my normal Louisiana incredulity. After all, nobody can come close to the pig roasts of Louisiana, right? Well, I tell you this, Nippers did a great job feeding a mob of people and the food really was excellent – as good a quality as you’ll find in Louisiana – and that’s damn good! There he is, seated in the shade with the blonde hair and sunglasses, Barefoot Man churns out his hits while the crowd sings along, word for word. People really enjoyed the music and danced away. 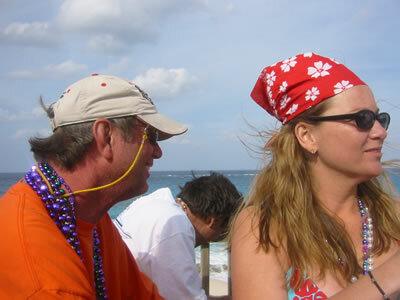 The lady to the left with green hat, orange dress and dred locks is Jan Albright – she is a great spearfisherwoman. She’s the Terminator! We didn’t meet Jan and her husband Cam until weeks after the concert. 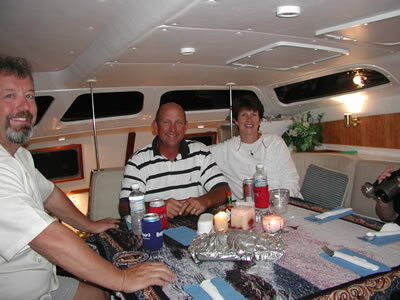 Jan and Cameron, fellow cruisers, were travelling aboard their boat "Te Amore." They helped me get proficient with a Hawaiian Sling spear. That’s retired pro ball player Ed Mickelson in the pool with the red “do rag” on. (That’s also his whip on the deck – I told you he was a character!) Ed staked out that deck as his “island” and it was by invitation only, or you face the whip! Chris, Trula, Melissa and I staked out our spot by one of the pools shortly before the throngs of Barefoot Man fans arrived. 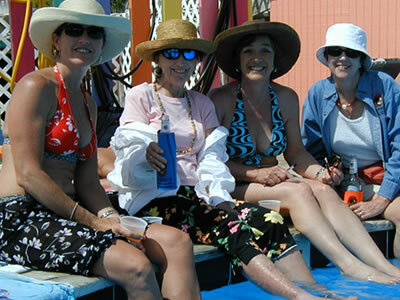 Thibodeaux ladies Lydia Goulas, Becky LeBlanc, Frances Jones and Wendy Murrian enjoyed the concert too! 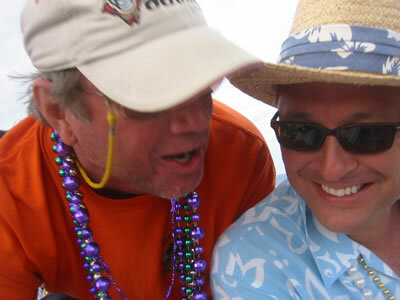 Wherever Cajuns party, beads are thrown – a tradition now transplanted to the Nippers’ Barefoot Man event. 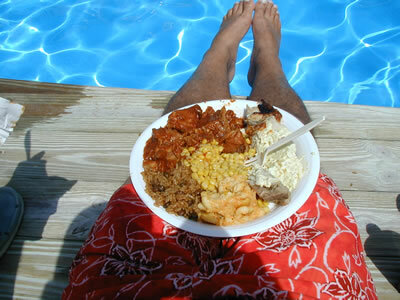 A plate of great food, my feet dangling in the pool, and the spectacle of the Barefoot Man concert on a perfect day. Paradise. 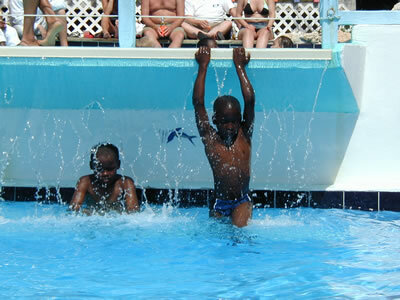 A good time was had by all at Nippers and the concert was a great success. Chris and Trula told me that David Manship had contacted his Mardi Gras bead maker in New Orleans by sunset and ordered several grosses of beads to be custom made with medallions bearing the Nippers logo and 2006 for the concert next year. It’s all about getting your priorities straight, right?! 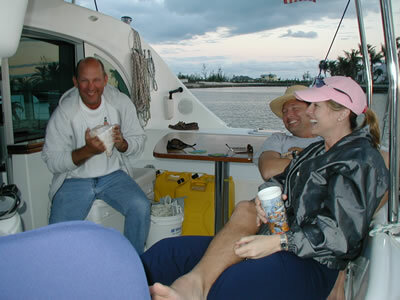 The next day, we departed Guana Cay and sailed to Hope Town, where Chris and Trula spent the final night of their trip with us. 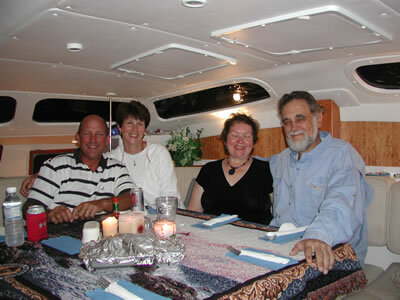 They treated us to a nice dinner out, where we sat dockside and enjoyed the picturesque Hope Town Harbor. 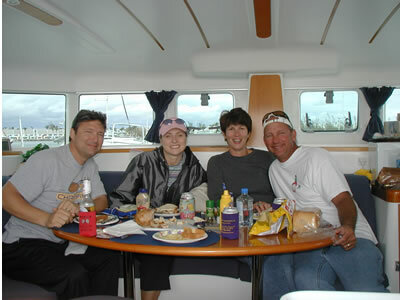 The next morning, Chris and Trula departed on one of the Albury Ferry’s to Marsh Harbor where they caught a cab to the airport. We were sad to see them go and wished they could have stayed longer. The Donnie VIII pulls out and Chris and Trula are on their way to Marsh Harbor and the airport to go home to Baton Rouge. Well, that’s a good breaking point and all for now. I am already behind in reporting our adventures, but so be it. 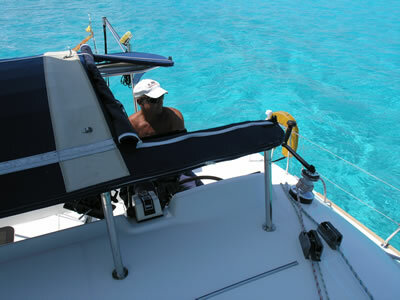 When the weather is good, we are too busy having fun or enjoying working on the boat to write. When the weather is bad, we are busy finding a good spot to hide out until it blows over. We will keep updating you, though. In the next installment, we will relate our adventures spearfishing for lobsters and fish, being stalked by sharks, and scuba diving while the biggest barracuda I’ve ever seen supervised from under the shade of Indigo Moon. Also, we will relate our experiences as we explored the north end of Guana Cay where Disney finally abandoned its Treasure Island venture. 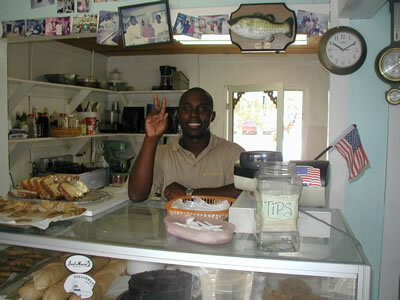 We have a lot of good pictures of Hope Town too, and we met more good Cajuns hanging out in the Bahamas. In the “what is it really like out there living on a sailboat?” department, I can tell you this: We have finally relaxed; more so for me than any time I can remember in the last twenty years. It’s great out here. Just the other day, I was listening to some music and it dawned on me that I was actually hearing all of it in seamless fashion with no mental interruptions. Something was definitely different, I thought. Then it hit me. I had no nagging preoccupations. No anxiety. No cross words with the world to contemplate. No interference voltage of “noise” thought existed in my brain – I am sure you know what I am talking about -- the kind of stuff that used to run through my mind and momentarily block my reception in a movie theater, or while watching the news waiting for the weather forecast only to “wake up” right after the forecast is over. Or, for example, not remembering in the morning if I had taken my vitamins yet, all because I was thinking of a gazillion other things and worrying about this and that I had to do that day. Somewhere out here I made the transition to a mental state that is clear of the prior distracting dissonance; just warm sun on my skin and an ability to take the time to really slow down and enjoy this life in the moment. It is fabulous beyond all description. This is also way cool: speaking of vitamins, but for the small, plastic flip-lid seven-day vitamin case I reload every Monday morning, I would not even know what day of the week it is anymore. I honestly don’t know how long this amazing hiatus from the “Mad World” will last. It’s so good it is sort of scary. It really is “too good to be true” in the purest sense. We don’t want it to ever end. Surely it will one day, and that is the only negative thought that creeps in on us now and then. We manage to put those thoughts “out the door” easily enough, though. Melissa always just laughs and says that even though this trip will surely ruin us for any possibility of a graceful return to the Mad World, warriors that we are, we shall simply trim our sails and head straight at whatever comes -- just like always. That’s my girl! When viewed as a whole, who cares anyway? What is really important in this life? For me, now that I have experienced total decompression, I can say that hearing ALL the music is now very high on our “life’s priority list”, even if it's just for a little while. For us, this experience has already lasted long enough, and been sweet enough to date, to have been worth all the expense, effort and industry -- even if it all ended today. And so, considering earthly life is so precarious and unpredictable, Melissa and I are keenly aware that we are truly blessed and obscenely lucky for each minute we are out here.